Bigasoft DVD Ripper is an easy-to-use DVD ripper tool which can perfectly rip DVD to various video and audio formats like AVI, DivX, Xvid, MP4, H.264, WMV, MOV, FLV, MKV, MPEG-1, MPEG-2, 3GP, 3GPP, VOB, RM, WMA, MP3, and so on with amazing speed and quality for watching DVD movies anytime anywhere and saving DVD discs from scratch. Bigasoft DVD Ripper, a handy DVD converter software, helps you rip a DVD to almost all video formats including AVI, DivX, Xvid, MP4, H.264, WMV, MOV, FLV, MKV, MPEG-1, MPEG-2, 3GP, 3GPP, VOB, RM, MOD, TOD, MTS, WMA, MP3, APE, and so on with amazing speed and high image quality for best enjoy DVD movies no matter where you are. The powerful DVD ripper software is also served as DVD audio software, which can extract audio tracks from all kinds of DVDs and convert DVD audio tracks to MP3, AAC, M4A, WMA, etc. It allows you to just rip some DVD chapters or titles and merge them if you like. Trim any part of the DVD movie into video clips, and cut off unwanted area of a video to feature a highlight. 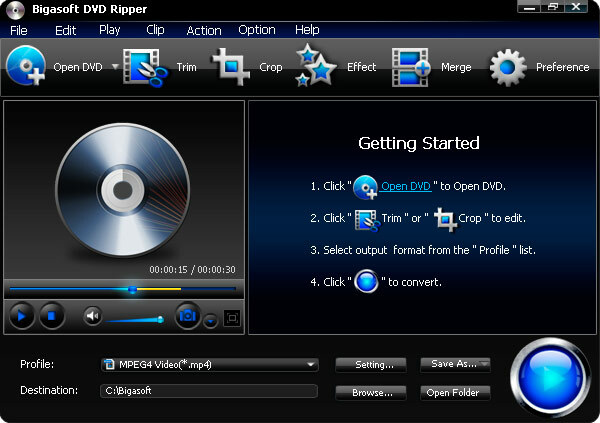 Bigasoft DVD Ripper offers a DVD editor to edit DVD movies like adding watermark, adjusting brightness, contrast and situation, adding special effects like black and white, oil painting to output video. With Bigasoft DVD Ripper, you can select subtitle and audio track in desired language. All the action can be fulfilled in the task list. Optimized by NVIDIA® CUDA computing technology and benefit from Multithreading, batch conversion and Multi-Core Processing, Bigasoft DVD Ripper accelerates conversion to revolutionary fast. Compatible with Windows 8, Windows 7, Windows XP, Windows Vista, and Windows 2000. Evaluation version of Bigasoft DVD Ripper can be downloaded from the following link. Bigasoft DVD Ripper costs 34.95 USD and can be purchased using this link. For a limited time you can get Bigasoft DVD Ripper free or at 100% discount from BitsDuJour promotion. Click on the Green Get It For Free button, enter your name and email address in the newly opened page under Registration Information and click on the green Complete Checkout button. You will soon receive a mail from notify[at]bitsdujour.com with the license information. You can also use coupon code BIGA-IK78 or use this link for purchase.